A protocol for the synthesis of a 1,2-dithiolane modified peptide and the characterization of the supramolecular structures resulting from the peptide self-assembly. Neves, R., Stephens, K., Smith-Carpenter, J. E. Synthesis and Characterization of 1,2-Dithiolane Modified Self-Assembling Peptides. J. Vis. Exp. (138), e58135, doi:10.3791/58135 (2018). This report focuses on the synthesis of an N-terminus 1,2-dithiolane modified self-assembling peptide and the characterization of the resulting self-assembled supramolecular structures. The synthetic route takes advantage of solid-phase peptide synthesis with the on-resin coupling of the dithiolane precursor molecule, 3-(acetylthio)-2-(acetylthiomethyl)propanoic acid, and the microwave-assisted thioacetate deprotection of the peptide N-terminus before final cleavage from the resin to yield the 1,2-dithiolane modified peptide. After the high-performance liquid chromatography (HPLC) purification of the 1,2-dithiolane peptide, derived from the nucleating core of the Aβ peptide associated with Alzheimer's disease, the peptide is shown to self-assemble into cross-β amyloid fibers. Protocols to characterize the amyloid fibers by Fourier-transform infrared spectroscopy (FT-IR), circular dichroism spectroscopy (CD) and transmission electron microscopy (TEM) are presented. The methods of N-terminal modification with a 1,2-dithiolane moiety to well-characterized self-assembling peptides can now be explored as model systems to develop post-assembly modification strategies and explore dynamic covalent chemistry on supramolecular peptide nanofiber surfaces. The robust peptide bond forming chemistry involved in solid-phase peptide synthesis and the ability to control sequence length and composition make the peptides that self-assemble into supramolecular structures a heavily researched field. The factors that control and stabilize peptide self-assembled structures, including side chain steric and electrostatic interactions, hydrogen bonding, and hydrophobic effects1, serve as a set of design rules. As the research into these fundamental design rules continues to progress, the logical next step in peptide self-assembly involves expanding the diversity of peptide-based structures and functions. While self-assembling peptides are a versatile biomaterial that have been used for many biomedical applications by tuning the peptide sequence or assembly conditions2,3,4, the development of strategies for post-assembly modifications to peptide nanofibers5,6,7,8,9 remains a relatively unexplored area. Dynamic disulfide exchange and thiol chemistry at the surface of supramolecular structures is one area that has the potential to yield new and functional biomaterials. The incorporation of 1,2-dithiolane moieties (commonly a derivative of lipoic acid (la) or asparagusic acid (aa)) have been reported in liposome systems10,11, block copolymers12,13, and as organizing anchors at surfaces14,15. Herein, we report the synthesis and characterization of a self-assembling peptide derived from the nucleating core of the Aβ peptide associated with Alzheimer's disease that is modified at the N-terminus with a 1,2-dithiolane functional group16,17. The resulting supramolecular fibers now serve as an experimental platform to study the disulfide-exchange and thiol reactivity at the supramolecular surface of amyloid fibers18. Synthesis of dithiolane precursor, 3-(acetylthio)-2-(acetylthiomethyl)propanoic acid19. Add 1 g of 3-bromo-2-(bromomethyl)propionic acid (1 equiv.) dissolved in minimal amount of 1 M NaOH (approximately 4 mL) to a 25-mL round bottom reaction flask with stirring at 55 °C. Seal the reaction flask with a septa and place under nitrogen atmosphere. Prepare a solution containing 1.49 g of potassium thioacetate (3.2 equiv.) in 4 mL of deionized water and 3 mL of 2 M sulfuric acid (H2SO4) to create thioacetic acid in situ. Pull the thioacetic acid solution into a plastic disposable 10 mL syringe and place a needle on the syringe. Add the mixture dropwise to the reaction flask by piercing through the septa with the needle. Continue the reaction overnight at 55 °C. Monitor the reaction by thin layer chromatography (TLC) on silica gel 60 F254 plates using a mixture of methanol and dichloromethane (1:9). Visualize the reaction progress by bromocresol green stain. The product has an Rf = 0.57. After the reaction is complete and cooled to room temperature, acidify the mixture to pH 1 with 2 M H2SO4. A yellow oil separates out of solution. Extract the product with cold chloroform (40 mL x 3). Combine the organic layers and dry over magnesium sulfate. Remove the chloroform under reduced pressure. Confirm the identity of the isolated product, 1, by nuclear magnetic resonance (NMR) spectroscopy as shown in Figures 1B and C. Expect the following results: 1H NMR, CDCl3, 300 MHz: d = 10.1 (b, 1 H), 3.2 (m, 4 H), 2.9 (m, 1 H), 2.4 (s, 6 H); 13C NMR, CDCl3, 75 MHz: d = 195.1 (CH3COS-), 177.6 (-COOH), 45.1 (-CH2S-), 30.5 (CH), 29.2 (-SCOCH3). Note: The product is a yellow oil and has an overall yield of 83%. Use the product without further purification. Note: The solid-phase peptide synthesis described below was conducted on an automated peptide synthesizer, following the recommended manufacturer’s protocols. Settings and reagents may be adapted for other commercial instruments or when using specialized amino acids. Weigh out 0.156 g of Rink amide 4-methylbenzhydrylamine (MBHA) resin (0.1 mmol) and place in a reaction vessel. Swell the resin in dimethylformamide (DMF) for at least 15 min prior to the start of the synthesis. Weigh out 4 equivalents of each fluorenylmethyloxycarbonyl (Fmoc) protected amino acid (0.4 mmol) in the sequence and 0.152 g of N,N,N’,N’-tetramethyl-O-(1H-benotriazol-1-yl)uranium hexafluorophosphate (0.4 mmol, HBTU) for each amino acid in the sequence. Each cartridge contains both the Fmoc-protected amino acid and HBTU. After running all pre-synthesis checks on the synthesizer (refill reagents, flushed reagent lines and pressurized all reagent bottles), place the amino acid cartridges into the carousel in the C’ to N’ terminus direction. Place an empty cartridge after the final amino acid position for the final N-terminal Fmoc deprotection step. Synthesize the peptide using the standard recommended settings. Deprotect the Fmoc group from the resin with 5 mL of 20% piperidine in DMF (5 min x 2). Wash the resin with DMF (6 x 5 mL) before the coupling step. For a single coupling step, add 4 mL of 0.4 M N-methylmorpholine in DMF to the Fmoc-protected amino acid and HBTU. Activate the Fmoc-protected amino acid solution for 30 s before transferring the solution to the reaction vessel. Note: The automated peptide synthesizer mixes the resin and the solution by bubbling N2 gas every 30 s for 20 min while the coupling reaction takes places. For manual peptide synthesis, place the reaction vessel on an orbital shaker at low speed for the duration of the coupling step. Drain the solution and wash the resin with DMF (3 x 5 mL). Repeat steps 1.2.4.1 through 1.2.4.4 for each Fmoc-protected amino acid in the C’ to N’-terminus direction to synthesize the peptide of interest. After the final N-terminal deprotection step, transfer the resin into a disposable fritted syringe. Wash the resin with DMF (3 x 5 mL) and dichloromethane (DCM, 3 x 5 mL). Note: The resin may be stored after DCM washing in a vacuum desiccator. If the resin was stored previous to coupling, ensure to swell the resin in DMF before the coupling reaction. Couple the dithiolane precursor (1) to the N-terminus of the on-resin peptide by adding 4 equivalents of 1, 5 mL of DMF, 4 equivalents of HBTU and 10 equivalents of N,N-diisopropylethylamine (DIPEA). Pre-activate the coupling mixture for 10 min before adding to the resin containing fritted syringe. Shake the coupling reaction for 2 h. After 2 h, wash the resin with DMF (3 x 5 mL) and repeat the coupling reaction with shaking overnight. After the second coupling, wash the resin with DMF (3 x 5 mL) and DCM (3 x 5 mL). Note: The resin can be stored at this point under vacuum until cleavage. To deprotect the thioacetate group from the N-terminus dithiolane precursor, transfer the dried resin to a 10 mL microwave reaction tube and add 2 mL of DMF. Allow the resin to swell, add a small magnetic stir bar to the vessel, and re-suspend with a low speed of magnetic stirring for 15 min. Add 2 mL of concentrated ammonium hydroxide, cap the reaction vessel with the silicone septa, and place the reaction vessel into a microwave reactor using the microwave settings of 75 °C for 45 min with stirring. After the microwave reaction is complete, transfer the resin into a clean disposable fritted syringe. Wash with DMF (2 x 5 mL) and methanol (MeOH, 2 x 5 mL). Add a solution of concentrated ammonium hydroxide in methanol (1:4), for a total volume of 5 mL. Leave to shake overnight to increase intramolecular oxidation of disulfide bond in dithiolane ring. Wash the resin with MeOH (2 x 5 mL) and DCM (3 x 5 mL). Note: The dried resin may be stored in a vacuum desiccator at this point. Add the cleavage cocktail to the resin containing syringe with gently shaking for 1.5 h. The cleavage cocktail used is 95% trifluoroacetic acid (TFA), 2.5% triisopropylsilane (TIPS), and 2.5% water at a total volume of 5 mL. CAUTION: Work under chemical fume hood only. TFA is volatile and corrosive. Note: For the majority of peptide sequences and amino acid sidechain protecting groups, the above cleavage cocktail solution is sufficient; however, alternative cleavage cocktails may be needed for certain amino acid side chain protecting groups (in particular peptides containing Cys, Met, Trp and Arg) or other resin chemistry20. Precipitate the crude peptide into 25 mL of cold diethyl ether in a 50 mL conical tube by dropwise addition from the fritted syringe. The peptide precipitates as a white solid. Pellet the peptide by centrifugation at 1300 x g for 10 min. Carefully decant the diethyl ether into a separate container for waste collection. Add another 25 mL of diethyl ether to the conical tube and re-suspend the precipitate by vortexing. Repeat the centrifugation at 1300 x g for 10 min and decant the diethyl ether again. Dry the pellet under vacuum. Note: Purify the crude peptide by reverse phase-HPLC. Collect and combine the peptide peaks and confirm the mass by MALDI-TOF mass spectrometry. Dissolve the crude peptide pellet in minimal amount of acetonitrile with 0.1% TFA. Due to the peptide’s hydrophobicity and aggregation propensity, gently heat the sample at 40 °C to aid in solubility. Note: Avoid higher temperatures and sonication of the peptide in order to prevent potential disulfide exchange reactions21,22,23. To prepare 1 mL of crude peptide for HPLC purification, add 400 μL of concentrated peptide stock in acetonitrile to 600 μL of H2O with 0.1 % TFA and filter through a 22 μm syringe filter into a HPLC vial. An additional 5% isopropanol can be added to prevent peptide aggregation and precipitation. Purify the peptide using C-18 semi-preparative column with a flow rate of 3 mL/min over a linear gradient of 15-55% acetonitrile in 20 min. Set the UV detectors to 222 nm (amide backbone) and 330 nm (disulfide bond). Collect and combine the peaks of interest (Figure 2A). Confirm the peptide product mass by MALDI-TOF mass spectrometer in the reflectron mode (Figure 2B). For analysis, mix 0.5 μL of collected peak on the MALDI plate with 0.5 μL of 2,5-dihydroxybenzoic acid (DHB) matrix (10 mg/mL DHB in 50% acetonitrile, 0.1% TFA). Note: Common adducts in MALDI-TOF mass spectrometry include the sodium and potassium salt adduct ([M+Na]+ and [M+K]+) peaks. Desalting the sample prior to the analysis is recommended if the salt adduct peaks suppress the signal of the main [M+H]+ peak. Additionally, an oxidized peak of [M+O]+ is also detected in the 1,2-dithiolane modified peptide. A report on laser induced oxidation from the MALDI ionization using DHB matrix suggests that factors including sample concentration, solvent, and laser intensity can be modified to limit the MALDI induced oxidation artifact24. After MALDI-TOF confirmation of the correct mass, lyophilize the peptide after flash freezing. Keep the lyophilized peptide powder under vacuum until assembly. To prepare self-assembly solution, weigh out 1 mg of the peptide powder using an analytical balance. Dissolve into a mixture (pH 7.5) of 20% acetonitrile and 10 mM (4-(2-hydroxyethyl)-1-piperazineethanesulfonic acid (HEPES) in a 1.5 mL microcentrifuge tube, to a final concentration of 1 mg/mL peptide assembly mixture. Vortex the assembly solution and leave to assemble at room temperature. Follow the peptide assembly process via Fourier-transform infrared (FTIR) spectroscopy every few days. A broad peak centered around 1670 cm-1 is the IR signature arising from unassembled peptides in the sample17. The peptide assembly samples usually take one to two weeks for the broad unassembled peak to disappear and reach maturation. Dry an aliquot of 8-10 μL of the assembly solution as a thin film on the ATR diamond crystal. Monitor the disappearance of a large and broad water peak from 1640 to 1630 cm-1 as the dry film forms. Acquire IR spectra from 1500-1800 cm-1 averaging 50 scans with a 2 cm-1 resolution. Acquire and subtract the background scans prior to each sample scan. The IR signature for β-sheet assembly is a sharp peak between 1625 and 1635 cm-1 (Figure 3A)25,26. Characterize the peptide assembly into β-sheet rich supramolecular structures by circular dichroism (CD). Record the spectra using a CD spectropolarimeter with a Peltier temperature control system. Pipette 30 μL of the assembly solution in a 0.1 mm path length microcuvette. Note: A cell holder is needed to clamp and position the short path length cell in the instrument. For each spectrum, set the CD instrument to the following parameters: scanning wavelengths of 300 nm to 180 nm, scanning rate of 100/min, band width of 1 nm, 25 °C, average of three scans. Collect a spectrum of the buffer (20% acetonitrile/10 mM HEPES, pH 7.5) and subtract from each sample scan as a control. The CD signature for β-sheets is an ellipticity minimum centered around 220 nm (Figure 3B)27. Allow two to three weeks for the peptide samples to mature into β-sheet rich supramolecular structures. Note: The assemblies can be imaged using transmission electron microscopy (TEM) at earlier stages of the assembly process as well. Pipette 10 μL of the peptide assembly solution onto the surface of TEM carbon grid. Note: Take care not to touch the pipette tip to the grid surface. High precision, self-closing tweezers are used to hold the TEM grid during preparation. Wait 1-2 min to allow the assemblies to adsorb onto the grid surface. Remove excess sample by touching filter paper to the edge of the grid. Prepare a 2% uranyl acetate stain by adding 100 μL of deionized water to commercially available 4% uranyl acetate solution. Pipette 10 μL of the 2% uranyl acetate stain onto the grid surface and incubate for 2-3 min. After the incubation, remove excess stain by touching filter paper to the edge of the grid. Place the TEM grids in a vacuum desiccator overnight. Store under vacuum until imaging. Image the prepared samples with TEM (Figure 3C). Typical parameters for microscopy are as follows: images at magnifications ranging from 9,300X to 23,000X, tungsten filament with an accelerating voltage of 120 kV. Note: ImageJ can be used to measure average fiber width of the supramolecular structures of acquired TEM images28. CAUTION: Please consult all relevant safety data sheets (SDS) before use. Several chemicals used in the synthesis, purification, and characterization of the described 1,2-dithiolane modified self-assembling peptides are corrosive or toxic and should only be used under a chemical fume hood. Always use appropriate personal protective equipment (including safety glasses, lab coat, full length pants, closed-toe shoes) when working in the laboratory. Aside from the initial one-step synthesis of the dithiolane precursor molecule, the rest of the 1,2-dithiolane modified peptide synthesis occurs on solid support (Figure 1A). The conversion of 3-bromo-2-(bromomethyl)propionic acid to 3-(acetylthio)-2-(acetylthiomethyl)propanoic acid, the dithiolane precursor, is confirmed by 1H and 13C NMR (Figure 1B and C) before it is coupled to the free N-terminus amine of a peptide still on-resin. The deprotection of thioacetate to thiols with ammonium hydroxide is performed using a microwave reactor and the 1,2-dithiolane is oxidized overnight in methanol before the 1,2-dithiolane modified peptide is cleaved from the resin. The crude peptide is purified by reverse phase HPLC (Figure 2A) and the product's mass is confirmed by MALDI-TOF mass spectrometry (Figure 2B). The purified 1,2-dithiolane peptide self-assembles into mature amyloid fibers over a 2-3 week period. FT-IR (Figure 3A) and CD spectroscopy (Figure 3B) are used to follow the assembly process and to characterize the extended β-sheet conformation. The fibers are imaged by TEM (Figure 3C). Figure 1. Synthetic scheme for the characterization of 1,2-dithiolane precursor molecule. (A) Synthetic scheme of the final 1,2-dithiolane modified peptide, 1,2-dithiolane-KLVFFAQ-NH2. (B) 1H-NMR of 3-(acetylthio)-2-(acetylthiomethyl)propanoic acid in CDCl3 at 300 MHz. (C)13C-NMR of 3-(acetylthio)-2-(acetylthiomethyl)propanoic acid in CDCl3 at 75 MHz. Please click here to view a larger version of this figure. Figure 2. Synthesis of 1,2-dithiolane modified peptide. (A) HPLC chromatogram from the purification of 1,2-dithiolane -KLVFFAQ-NH2. (B) MALDI-TOF mass spectrum of the main peak from HPLC purification (retention time of ~17.5 min) in reflectron mode using DHB matrix confirms the calculated mass of 1,2-dithiolane-KLVFFAQ-NH2. Common adducts are also identified. Please click here to view a larger version of this figure. Figure 3. Supramolecular characterization of 1,2-dithiolane modified peptide. (A) FT-IR of 1 mg/mL 1,2-dithiolane-KLVFFAQ-NH2 fibers assembled in 10mM HEPES, pH 7.5 in 20% CH3CN. The peak at 1627 cm-1 is consistent with the peptides assembled in a β-sheet conformation. (B) CD of 1 mg/mL 1,2-dithiolane-KLVFFAQ-NH2 fibers assembled in 10 mM HEPES, pH 7.5 in 20% CH3CN. The ellipticity minimum at 218 nm is consistent with the peptides assembled in a β-sheet conformation. (C) Image of the 1,2-dithiolane-KLVFFAQ-NH2 amyloid fiber (negative stain of 2% uranyl acetate) by TEM. Scale bar is 100 nm. Please click here to view a larger version of this figure. This article discusses the details of both the synthesis and the purification of an N-terminal 1,2-dithiolane modified self-assembling peptide and the characterization of the resulting supramolecular structures. The synthesis of the 1,2-dithiolane peptide reported here has the advantages, including a one-step synthesis to produce the dithiolane precursor, 3-(acetylthio)-2-(acetylthiomethyl)propanoic acid, and the on-resin microwave deprotection reaction of the precursor thioacetate protecting group to yield the oxidized 1,2-dithiolane moiety utilizing ammonium hydroxide as a safer alternative to the toxic hydrazine deprotection reported previously29. The overall solid-phase peptide synthesis of the 1,2-dithiolane peptide (Figure 1A) can be easily modified by changing the sequence length and composition, including using Fmoc-protected unnatural amino acids, and C-terminal resin chemistry to suit many different research applications. In order to prevent unwanted peptide by-products when the amino acids with nucleophilic side chains or the amino acids with protecting groups have reactive cleavage products, additional scavengers should be added to the cleavage cocktail20. A test cleavage of a small portion (less than 10% of total resin) may be performed before the on-resin microwave deprotection step to ensure a high yield of coupling reaction. 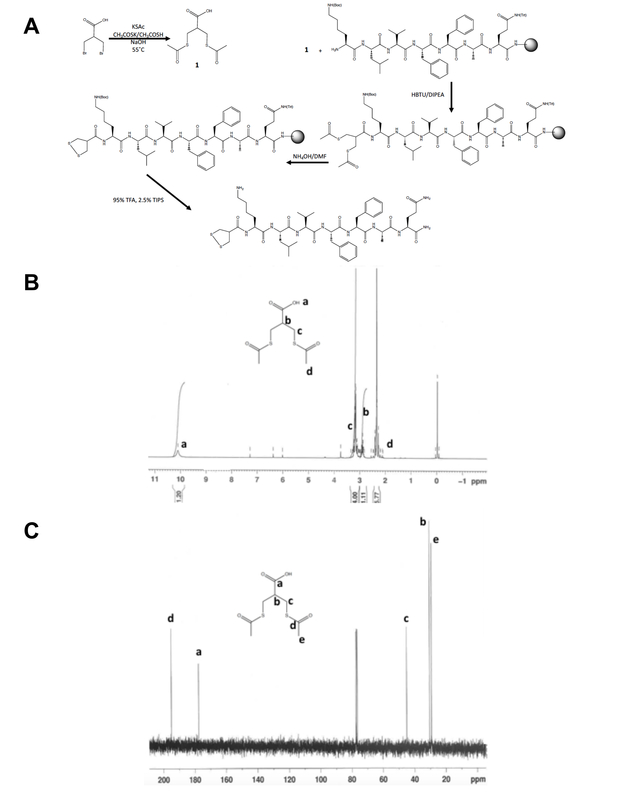 Using the column and HPLC conditions described in the report, the thioacetate protected 1,2-dithiolane precursor peptide peak elutes 5 min after the uncoupled free amine peptide. If a significant amount of free amine peptide remains, another coupling step with 3-(acetylthio)-2-(acetylthiomethyl)propanoic acid is recommended. The intramolecular 1,2-dithiolane disulfide bond is detected on the HPLC by monitoring the weak disulfide bond absorbance at 330 nm. The HPLC peak corresponding to the oxidized 1,2-dithiolane is confirmed by adding 100 L of 100 mM tris(2-carboxyethyl)phosphine(TCEP) to a peptide sample in a separate HPLC run. The TCEP reduced thiol containing peptide will have a different retention time than the oxidized disulfide peptide. The thiol containing peptide elutes approximately 1 min later than the disulfide peptide using the column and conditions described in the report. A suitable alternative MALDI matrix for peptides is α-cyano-4-hydroxycinnamic acid (CHCA) and is prepared by adding 1 mL of 50% acetonitrile with 0.1% TFA to 5 mg of CHCA. The samples can be desalted by using a C18 zip-tip prior to MALDI-TOF mass analysis if the salt adduct (Na+ and K+) peaks significantly suppress the [M+H]+ peak. The peptide sequence chosen for these studies is derived from Dutch mutant of the Aβ-peptide associated with Alzheimer's disease30, and has previously been shown to self-assemble into amyloid fibers of parallel β-sheets16,17. As shown in the representative results, Figure 3A-C, the 1,2-dithiolane-KLVFFAQ-NH2 peptide also assembles into amyloid fibers. The FTIR amide I stretch centered at 1627cm-1 and CD ellipticity minimum at 218 nm are spectroscopic signatures of β-sheet assemblies25,26,27, and the carbonyl CO stretch at 1676 cm-1 corresponding to ordered glutamine side-chain interactions suggest that the peptides are organized in parallel β-strands16,31,32. Transmission electron microscopy images, using 2% uranyl acetate negative stain, show extended and twisting supramolecular fibers that are approximately 10 nm in width. The fibers of the N-terminal acetylated peptide, Ac-KLVFFAQ-NH2, are smooth and straight, with a slightly larger width of almost 12 nm16. 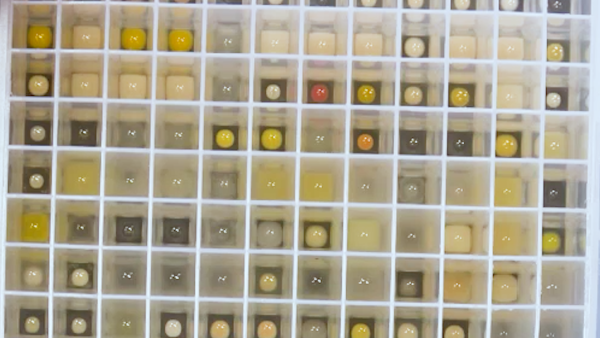 Since preparing TEM grids and acquiring images is a time intensive process, it is best to prepare several TEM grids from the same assembly sample at once of varying peptide concentrations. Prepare a diluted sample for TEM (1:50 or 1:100) alongside the original assembly solution sample. The amyloid fibers at high concentrations may adhere to the grid in clumps or patches and acquiring images of individual fibers may be difficult. It is important to see the edges of individual fibers for width measurements and the visualization of fiber helicity is often obscured by overcrowded samples. As more applications using supramolecular biomaterials are being explored, there is a need to integrate potentially reactive functional groups that are orthogonal to the self-assembly process into the self-assembling monomers. The methods described in this report highlight an on-resin approach to the synthesis of a 1,2-dithiolane modified self-assembling peptide and spectroscopic characterization of the supramolecular structures. The authors would like to thank Dr. B. Ellen Scanley for her technical training and help using the TEM at the Connecticut State Colleges and University (CSCU) Center for Nanotechnology and Dr. Ishita Mukerji at Wesleyan University for access to her CD spectrophotometer. The work reported was in part supported by the Science Institute at Fairfield University, the NASA Connecticut Space Grant Consortium, and by the National Science Foundation under Grant Number CHE-1624774. Thin walled Precision NMR tubes Bel-Art 663000585 5mm O.D. disposable fritted syringe Torviq SF1000LL 10mL fritted syringes were used in the report, but larger syringes are avaibale if needed for larger scale synthesis. Circular Dichroism Spectropolarimeter J-810, JASCO Used with a six-cell Peltier temperature controller. Accessed at Wesleyan University. Wang, J., Liu, K., Xing, R., Yan, X. Peptide self-assembly: Thermodynamics and kinetics. Chemical Society Reviews. 45, 5589-5604 (2016). Dong, R., et al. Functional supramolecular polymers for biomedical applications. Advanced Materials. 27, 498-526 (2015). Edwards-Gayle, C. J. C., Hamley, I. W. Self-assembly of bioactive peptides, peptide conjugates, and peptide mimetic materials. Organic and Biomolecular Chemistry. 15, 5867-5876 (2017). Goor, O. J. G. M., Hendrikse, S. I. S., Dankers, P. Y. W., Meijer, E. W. From supramolecular polymers to multi-component biomaterials. Chemical Society Reviews. 46, 6621-6637 (2017). DiMaio, J. T. M., Doran, T. M., Ryan, D. M., Raymond, D. M., Nilsson, B. L. Modulating supramolecular peptide hydrogel viscoelasticity using biomolecular recognition. Biomacromolecules. 18, 3591-3599 (2017). DiMaio, J. T. M., Raymond, D. M., Nilsson, B. L. Display of functional proteins on supramolecular peptide nanofibrils using a split-protein strategy. Organic and Biomolecular Chemistry. 15, 5279-5283 (2017). Mahmoud, Z. N., Gunnoo, S. B., Thomson, A. R., Fletcher, J. M., Woolfson, D. N. Bioorthogonal dual functionalization of self-assembling peptide fibers. Biomaterials. 32, 3712-3720 (2011). Petkau-Milroy, K., Uhlenheuer, D. A., Spiering, A. J. H., Vekemans, J. A. J. M., Brunsveld, L. Dynamic and bio-orthogonal protein assembly along a supramolecular polymer. Chemical Science. 4, 2886-2891 (2013). Li, A., et al. Neurofibrillar tangle surrogates: Histone H1 binding to patterned phosphotyrosine peptide nanotubes. Biochemistry. 53, 4225-4227 (2014). Sadownik, A., Stefely, J., Regen, S. L. Polymerized liposomes formed under extremely mild conditions. Journal of the American Chemical Society. 108, 7789-7791 (1986). Zhang, N., et al. ATN-161 Peptide functionalized reversibly cross-linked polymersomes mediate targeted doxorubicin delivery into melanoma-bearing C57BL/6 mice. Molecular Pharmaceutics. 14, 2538-2547 (2017). Margulis, K., et al. Formation of polymeric nanocubes by self-assembly and crystallization of dithiolane-containing triblock copolymers. Angewandte Chemie International Edition. 56, 16357-16362 (2017). Zhang, X., Waymouth, R. 1,2-Dithiolane-Derived Dynamic, Covalent Materials: Cooperative Self-Assembly and Reversible Cross-Linking. Journal of the American Chemical Society. 139, 3822-3833 (2017). Sakia, N., Matile, S. Stack exchange strategies for the synthesis of covalent double-channel photosystems by self-organizing surface-initiated polymerization. Journal of the American Chemical Society. 133, 18542-18545 (2011). Uji, H., Morita, T., Kimura, S. Molecular direction dependence of single-molecule conductance of a helical peptide in molecular junction. Physical Chemistry Chemical Physics. 15, 757-760 (2013). Liang, C., Ni, R., Smith, J. E., Childers, W. S., Mehta, A. K., Lynn, D. G. Kinetic intermediates in amyloid assembly. Journal of the American Chemical Society. 136, 15116-15149 (2014). Smith, J. E., et al. Defining the dynamic conformational network of cross-β peptide assembly. Israel Journal of Chemistry. 55, 763-769 (2015). Black, S. P., Sanders, J. K. M., Stefankiewicz, A. R. Disulfide exchange: Exposing supramolecular reactivity through dynamic covalent chemistry. Chemical Society Reviews. 43, 1861-1872 (2014). Vendetti, A., et al. Dihydroasparagusic acid: Antioxidant and tyrosinase inhibitory activities and improved synthesis. Journal of Agricultural and Food Chemistry. 61, 6848-6855 (2013). Stawikowski, M., Fields, G. B. Introduction to peptide synthesis. Current Protocols in Protein Science. 26, (2002). 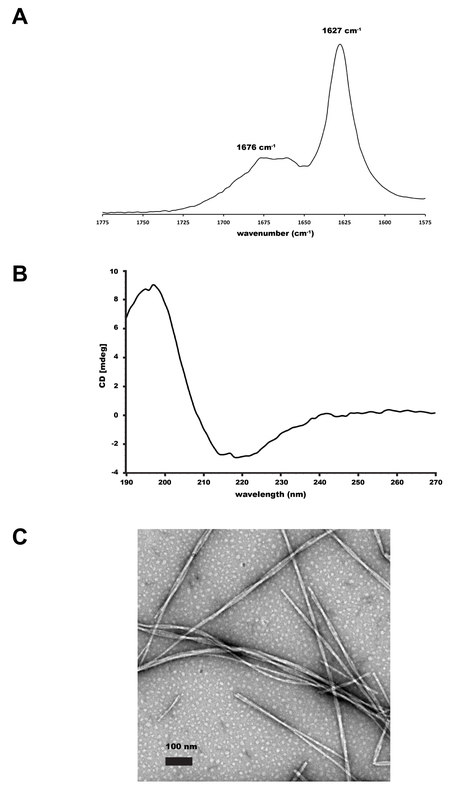 Canadell, J., Goossens, H., Klumperman, B. Self-healing materials based on disulfide links. Macromolecules. 44, 2536-2541 (2011). Lafont, U., van Zeijl, H., van der Zwaag, S. Influence of cross-linkers on the cohesive and adhesive self-healing ability of polydisulfide-based thermosets. ACS Applied Materials and Interfaces. 4, 6280-6288 (2012). Komaromy, D., Stuart, M. C. A., Santiago, G. M., Tezcan, M., Krasnikov, V. V., Otto, S. Self-assembly can direct dynamic covalent bond formation toward diversity or specificity. Journal of the American Chemical Society. 139, 6234-6241 (2017). 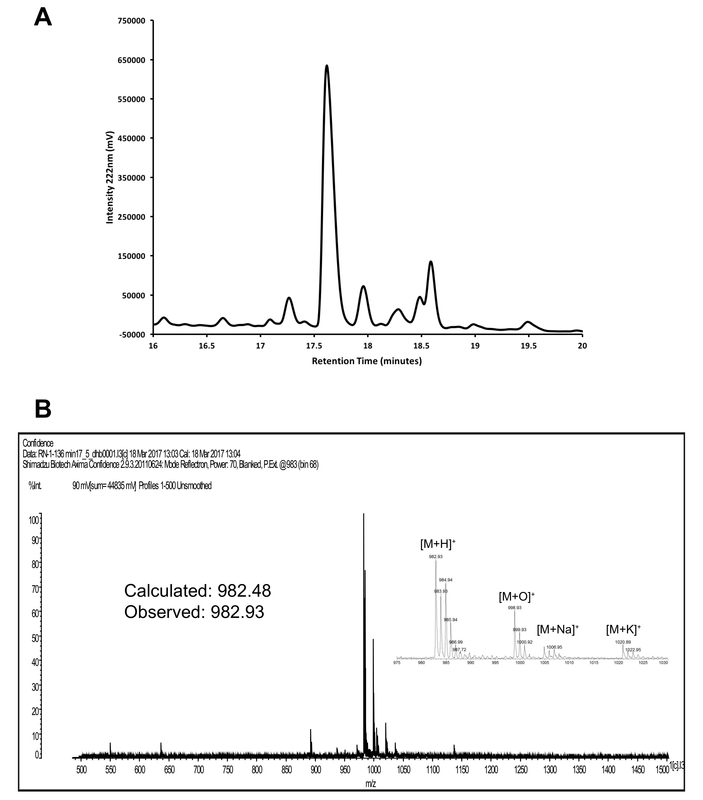 McAvery, K. M., Guan, B., Fortier, C. A., Tarr, M. A., Cole, R. B. Laser-induced oxidation of cholesterol observed during MALDI-TOF mass spectrometry. Journal of the American Society for Mass Spectrometry. 22, 659-669 (2011). Krimm, S., Bandekar, J. Vibrational spectroscopy and conformation of peptides, polypeptides, and proteins. Advances in Protein Chemistry. 38, 181-364 (1986). Halverson, K. J., Sucholeiki, I., Ashburn, T. T., Lansbury, P. T. Location of β-sheet-forming sequences in amyloid proteins by FTIR. Journal of the American Chemical Society. 113, 6701-6703 (1991). Greenfield, N., Fasman, G. D. Computed circular dichroism spectra for the evaluation of protein confirmation. Biochemistry. 8, 4108-4116 (1969). Rasband, W. S. ImageJ. National Institutes of Health. Bethesda, Maryland, USA. Available from: https://imagej.nih.gov/ij (2016). Roy, S., Shinde, S., Hamilton, G. A., Hartnett, H. E., Jones, A. K. Artificial [FeFe]-hydrogenase: On resin modification of an amino acid to anchor a hexacarbonyldiiron cluster in a peptide framework. European Journal of Inorganic Chemistry. 2011, 1050-1055 (2011). Van Duinen, S. G., Castano, E. M., Prelli, F., Bots, G. T. A. B., Luyendijk, W., Frangione, B. Hereditary cerebral hemorrhage with amyloidosis in patients of Dutch origin is related to Alzheimer disease. Proceedings of the National Academy of Sciences of the United States of America. 84, 5991-5994 (1987). Barth, A. The infrared absorption of amino acid sidechains. Progress in Biophysics and Molecular Biology. 74, 141-173 (2000). Jayaraman, M., et al. Slow amyloid nucleation via α-helix-rich oligomeric intermediates in short polyglutamine-containing Huntingtin fragments. Journal of Molecular Biology. 415, 881-899 (2012).